One of the most important decisions you will ever make will affect every aspect of your life. It’s the decision to commit to love and accept yourself. It affects the quality of all your relationships, your work, your future, etc. 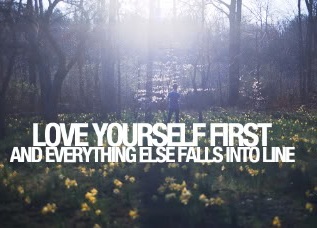 Loving yourself is vitally important and it’s at the very core of your wellbeing. It directly affects your joy, self-empowerment and your ability to enjoy the kind of life you desire and deserve. You can’t enjoy happiness if you aren’t at peace with yourself. Not loving yourself can be severely debilitating. At the least, you will experience indecision and self-doubt. However it could be much worse and you could suffer from depression or self-loathing. There is nothing wrong with loving yourself. It’s necessary for you to lead a happy and successful life with confidence. Your happiness comes from within as does love so your happiness is directly linked to the love you have for yourself. Self-esteem and self-love are issues that are deeply related. If you have low self-esteem, it’s possible that the root cause is insufficient self-love. If you are confident in yourself or have high self-esteem it most likely is because you accept and love yourself unconditionally. When you decide to love yourself, you are really saying that you want to come alive and live life to the fullest in every area. You realize and accept that you are responsible for your life experiences. So how do you love yourself? Here are some ways that could be helpful. 1. Get in touch with yourself. Find out what makes you, you. Just like a plant needs watering to grow, learn to nurture yourself in every way. It is absolutely beneficial to embrace all the good that is in your life. But you must also accept your flaws and the fact that you are not perfect. Yes, change may come from realizing your shortcomings but more importantly you should be kind and gentle to yourself despite your flaws. Look in a mirror and fall in love with the reflection of you. 2. Pay attention to your self-talk. Learn to talk to yourself in an affirming and loving way. Many times people talk negatively to themselves and keep saying things like, “I’m not good enough,” “I can’t do anything right,” or worse. When you talk negatively to yourself you wear yourself down. When you talk positively to yourself, you program your subconscious mind with positive images which will manifest in you experiencing self-love. 3. Forgive yourself. So you’ve made mistakes. So has everyone else in the world. There are some people that keep feeling guilty after making mistakes. They believe they don’t deserve to be forgiven. There is no mistake that you have ever made that doesn’t deserve forgiveness from yourself. It might take some time but once you change your mindset and realize that it’s ok to forgive yourself, you will experience freedom from the guilt of your mistakes and will begin to love yourself more. 4. Trust yourself. Be confident in your abilities and know that you are better than you think you are. 5. Stop looking for approval. Most people have sought the approval of someone else at some point in life and there is nothing wrong with that. But once the “want” of an approval turns into a “need” for an approval it can become dangerous to your self-love. Not needing to seek approval is good because it will help build your self-confidence. Yes it is definitely important to listen to others but remember their opinions are no more important than your opinion. 6. Relax and have fun. Give yourself some time to take breaks and inject some fun into your life. Life is meant to be enjoyable. Don’t take yourself or life too seriously. Allow yourself some down time to pamper yourself and relax. Enjoy some silence, soothing music or anything else that will nourish your soul, mind and body. 7. Grow spiritually. When you spend time growing spiritually, the love for yourself will come naturally. You will become more peaceful, kind, loving and compassionate. When you nurture your soul, mind and body daily, you will naturally love yourself in the process. Full disclosure: I have not mastered ANY of these 7 steps. But I’m on a journey and I’m learning to apply them to my life, appreciate and accept the person I am and live life to the fullest. Tagged acceptance, authentic, forgiveness, loving yourself, self confidence, self esteem, self-love, spiritual, trust. Next Post What is Joel Osteen Doing Wrong and What Does He Need to Change?